This study offers a comprehensive reconsideration of the life and literary works of Paulinus of Nola (ca. 352-431), a Roman senator who renounced his political career and secular lifestyle to become a monk, bishop, impresario of a saint's cult, and prominent Christian poet. Dennis Trout considers all the ancient materials and modern commentary on Paulinus, and also delves into archaeological and historical sources to illuminate the various settings in which we see this late ancient man at work. This vivid historical biography traces Paulinus's intellectual and spiritual journey and at the same time explores many facets of the late ancient Roman world. 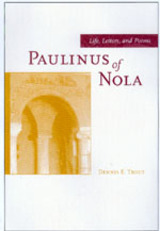 In addition to filling out the details of Paulinus's life at Nola, Trout looks in depth at Paulinus before his ascetic conversion, providing a new assessment of this formative period to better understand Paulinus's subsequent importance within the influential ascetic and ecclesiastical circles of his age. Trout also highlights Paulinus's place in the swirl of rebellions and heresies of the time, in the pagan revival of the 390s, and especially in the development of a new genre of Christian poetry. And, he examines anew Paulinus's relationships with such figures as Jerome, Rufinus, and Augustine. Trout fully explores the complexity of a figure who has too often been simplified and provides new insights into the kaleidoscopic character of the age in which he lived. Dennis E. Trout is Associate Professor of Classics at Tufts University.